Good morning, Eagles fans. The Eagles are not yet NFC East champions after the Dallas Cowboys won last night. That means the Eagles must beat the Seattle Seahawks on Sunday to clinch the division crown this week. You're reading the Friday edition of Early Birds. It's free for anyone to sign up here to receive in your inbox every weekday. I want to know what you think, what we should add, and what you want to read, so send me feedback by email or on Twitter @ZBerm. Thank you for reading. DEFENDING WILSON: There's been a lot of attention paid to Russell Wilson this week, and for good reason. The Seahawks have 27 offensive touchdowns this season, and 26 have come from either the arm or legs of Wilson. He is almost their entire offense — it's not as if they have the balanced attack of some other teams, or the run-heavy offense of past Seahawks teams. If the Eagles can neutralize Wilson, they'll win. But that's easier said than done. Wilson is so elusive and so dangerous on off-schedule plays that he creates problems even if the Eagles get past a leaky Seahawks offensive line. And like Carson Wentz, he raises his play in the red zone. Wilson has 16 touchdowns and one interception in the red zone with a 94.2 quarterback rating. The Seahawks need a big game from Wilson to win, and a red-hot Eagles defense could be challenged unlike any other point this season. TIME FOR WENTZ: Wentz could take advantage of Seattle's depleted secondary, but that's only if he has the time he needs. Seattle has a tough front seven that can take advantage of the crowd noise when rushing the quarterback. The Eagles offensive line has played well in recent weeks, but it could be different on the road than at home. Michael Bennett leads Seattle with 7.5 sacks. He'll be blocked by Lane Johnson, who's the Eagles' best offensive lineman. Pay attention to the other side, where Frank Clark will put pressure on Halapoulivaati Vaitai. MATCHING THE INTENSITY: Seattle is always a tough place to play in December, but the Seahawks are a desperate team that must win to avoid falling behind in the playoff hunt. If the season ended this week, the Seahawks would be on the outside looking in and their five-year streak of postseason bids would be snapped. They have a tough-minded, prideful group that should give the Eagles their best shot on Sunday. The same was probably said about Dallas two weeks ago, and you saw how that turned out. Sometimes, intangibles don't matter in games as much as the hype would suggest. This week, I think they will. It will be a playoff-type atmosphere. 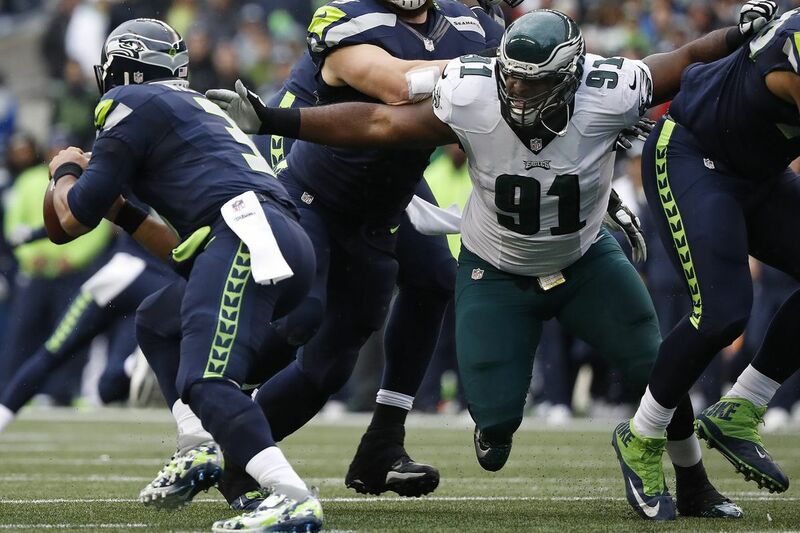 The Eagles must match Seattle's intensity to win. The Eagles won't board a flight to Philadelphia on Sunday after the game. Les Bowen writes about the Eagles preparing to stay out west. LeGarrette Blount is holding off Jay Ajayi with the way he's playing, Jeff McLane writes in his weekly notes. He also has some updates on the progress of rookies. Doug Pederson has had success scripting plays, Paul Domowitch writes in his weekly notes. Domo also sizes up Baker Mayfield as a prospect. Malcolm Jenkins will not raise his fist during the national anthem on Sunday. Why have the Eagles been successful in the red zone? McLane breaks down the film. The beat writers offer their Eagles-Seahawks predictions. Ed Barkowitz gives you all the game information you need, including the referee and gambling information. Thursday: What did Carson Wentz think of LeBron James' comments? Wednesday: More on the crowd noise. Tuesday: Jason Peters spent Sunday with the Eagles. Monday: Credit to the Eagles' top-ranked rushing defense. Eagles defensive tackle Tim Jernigan feels like he has found a home in Philadelphia after signing his extension. Zach Berman: If you were giving yourself a scouting report, what separates you as a defensive tackle? Tim Jernigan: "I don't think a lot of people play the game like I play anymore. And that's not even from a talent standpoint. All from a mindset standpoint. You don't come across many, in my eyes, who play the way I play. You come across some damn good ones, people who are probably better stat-wise, but the way I play, the swagger I play with, ain't nobody got that." Zach Berman: You've been described as a junkyard dog. What does that mean to you? Tim Jernigan: "It's crazy, because I was in college, I remember [Jeremy] Pruitt, our defensive coordinator, he'd always say, 'That's what we want, we want junkyard dogs, 11 junkyard dogs on the field. We don't need no pretty boys.' I take it as a compliment." Zach Berman: You've played meaningful December football. What's different this time of year? Tim Jernigan: "Really, I think those early-season games, all they can do is help you set up for what's about to happen in November and December. The beginning of the season is important, but that later stretch is definitely more important – especially if you're in the situation where you have a fighting chance to get into the playoffs. Because the main thing is just getting in the playoffs. Because once you're there, everything you've done before doesn't matter. It's only a three-, four-game season. The biggest thing is just getting to the playoffs." Joe Walker has missed the past two days with a stinger. If he doesn't play, look for veteran Dannell Ellerbe to be active for the first time and play middle linebacker. Najee Goode is another option, but this is why the Eagles signed Ellerbe. After three weeks, he should be far enough along to fill that role in base downs. "He's still improving," defensive coordinator Jim Schwartz said. "He got some practice time last week. I told all our guys, no matter what role you have, you're going to have to contribute in some way. I'm confident that he'll be ready when his time comes, whenever that is." How important are these next two games for the eagles? Not just for playoff positioning, but for their psyche as well. These games are huge for the Eagles. They might affect playoff positioning, although the Eagles could potentially be in good position even if they lost both of these games. A 10-1 record gives them cushion, and 13-3 is usually good enough for a first-round bye. But you raise a good point about the psyche. I think that's relevant. There's a certain confidence that comes from beating these types of teams, and confidence is a powerful tool in the NFL. The Eagles are a confident team right now. Would it be different if they return to Philadelphia 1-1 or 0-2? They shouldn't be swayed if they're 1-1 on this trip. I'd consider that a successful trip. A winless trip would be different. Carson Wentz's second-year leap. I thought Wentz would show considerable improvement in Year 2, but I didn't expect him to enter MVP conversation. If Wentz just had normally progression from last year, they're probably a 9-7 or 10-6 team this year. What you're seeing this year is rare. It's a credit to Wentz. The play of the cornerbacks. In August, I thought the cornerbacks would be a major problem for this team and opposing quarterbacks would feast on the secondary. I was wrong. They've been so steady, and that was even without Ronald Darby for much of the season. Jalen Mills has developed into a dependable player and Patrick Robinson went from roster block to key contributor. How they've overcome injuries. Injuries are inevitable in the NFL, and I didn't think the Eagles had the depth to overcome key injuries. They lost Jason Peters, Darren Sproles, and Jordan Hicks, and they've played games without Fletcher Cox, Lane Johnson, Zach Ertz, and Darby, among others. Yet they kept winning. Doug Pederson created a good culture that remains strong when someone goes down, and Howie Roseman did a good job assembling the roster.